PAT - Traditional Sardinian Agri-food Product recognized by the Ministry of Agriculture, Food and Forestry, on the proposal of the Sardinia region. Dense liquid of light brown color, obtained from prolonged cooking of the pulp and the juice of the fruits of the prickly pear, used for the preparation of sweets. ingredients: fresh prickly pears, orange peel, fresh wild fennel. It is prepared in the month of September when prickly pears reach an optimum ripeness. Collected the ripe figs in the local countryside, in the same day (to avoid souring) peeled and squeezed by crushing them with your hands. It is then passed to a first firing of about 30 minutes which has the purpose of promoting the detachment of the seeds from the pulp. It then proceeds to casting using a piece of burlap sack that, thanks to the wide weft, manages to separate the seeds from the juice. He finally goes to cooking that must take place over a slow fire for about 6 hours. To flavor the sapa, during boiling, add the air-dried orange peel in winter and a small bunch of wild fennel inflorescences. The liquid must refine juice until it becomes thick, what happens when you reduce to approximately one-fifth. Reaching the ideal density, it stops the cooking process and allow to cool. It is then stored in glass bottles closed with cork stoppers making sure that there are no contacts with the air. It should also be kept away from sources of light or heat. The duration of the sapa it can vary from 2 to 5 years. 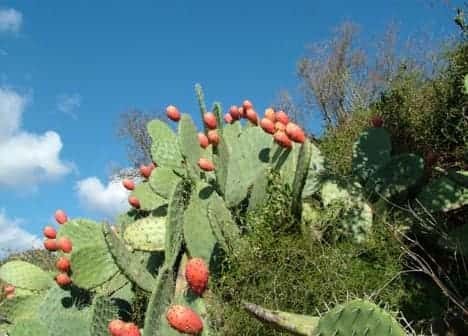 La sapa of prickly pear was and is a substitute product of the sapa of grape must. Once, it was prepared only by the poor population who, not having vineyards and therefore must, could in this way realize those traditional sweets (in particular the bread 'and saba) that are based on this basic ingredient. It is a product that you know at least 100 years, according to the memory of very old people who have passed on the recipe and the savoir faire. As well as a basic ingredient in past periods of misery, was consumed for imbeverci the bread, then as a food that not only helped to feed the children. Currently it is still produced at family level for confectionery use and sometimes it is also marketed on a decidedly informal circuit. Select a category to get a list limited to corresponding products. Do you know this Sardinian product? Contribute to this project too! Publish a description and images of "Sapa di Fico d'India - Saba and Figu Morisca". It protected natural areas, also commonly called natural oasis, with function of maintaining the environmental balance of a given place, increasing its biodiversity. List of Italian museums, devoted to the collection, public or private, of objects relative to one or more sectors of culture (including, in particular, by tradition, the art), science and technology. List of complex karst (natural caves).